. Darumapedia - Newsletter . 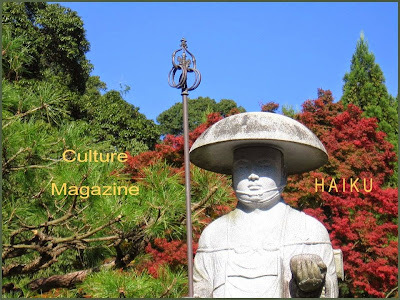 The Darumapedia has expanded over the years.
. Joys of Japan - Main Gallery .
. Joys of Japan - Poetry for Tohoku .
. Tohoku Japan - Information .
. WASHOKU - Japanese Food Culture . Almost four years have past since my "Facebook Life" started. Soon there was more and more, my own galleries and pages of others. 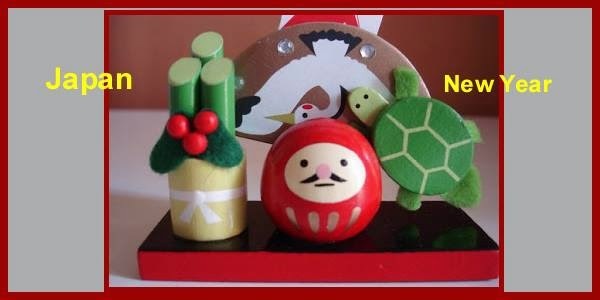 Here I want to create a resource of forums and pages about Japan.
. Japan on Facebook .
. MINGEI - Japanese Folk Art .
. Kappa　河童 / 合羽　/ かっぱ water goblin .
. Japanese Festivals - Matsuri .
. Japanese Interior Gallery .
. Shikoku - Gallery .
. The Heian Period　平安時代 (794 - 1185) .
. Edo 江戸時代　the Edo Period .
. Edo - Senryu 川柳 .
. Fudo Myo-O　Gallery 不動明王　.
. Enku - Master Carver 円空　- .
. Jizo Bosatsu Gallery .
. Kannon Bosatsu Gallery .
. Yakushi Nyorai Gallery .
. Buddha Statues - Japanese Deities .
. Buddhist Temples - Japan .
. Shinto Shrines - Japan .
. Japan in Spring .
. Japan in Summer .
. Japan in Autumn .
. Japan in Winter .
. Japan - New Year Season .
. Fujisan Gallery - Japan .
. Dragon Gallery - Asian Art and Animals .
. Japan - Animals .
. Haiku Culture Magazin .
. Mongolia Saijiki - Mongolian Haiku .
. WKD - World Kigo Database .
. Japanese Haiku Poets　.
. Japan - Rural Revitalization .
. My Treasure Box .
. Mihara Daruma 三原だるま . 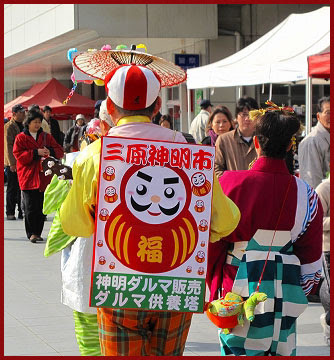 are a type of elaborately costumed street musicians in Japan that advertise for shops and other establishments. The performers advertised the opening of new stores and other venues, or promoted special events such as price discounts. Nowadays, chindon'yas are rare in Japan. The word consists of Japanese sound symbolism chin and don to describe the instruments, and the -ya suffix which roughly equates to the English "-er" suffix in this context. Street performers existed in Japan for a long time. 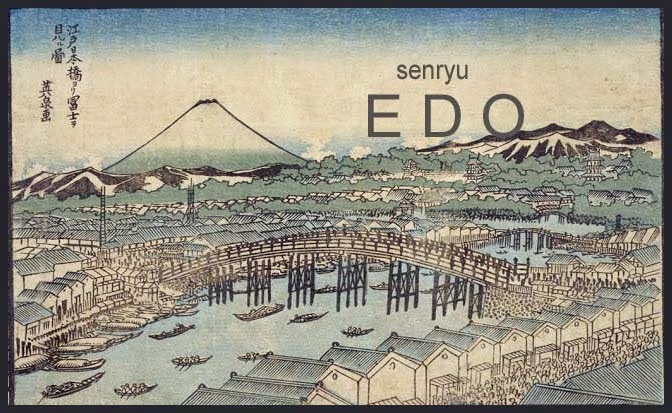 However, the connection with advertising forming a chindon'ya first appeared in Osaka during the 19th century (Late Edo period and early Meiji period) at the beginning of industrialization. 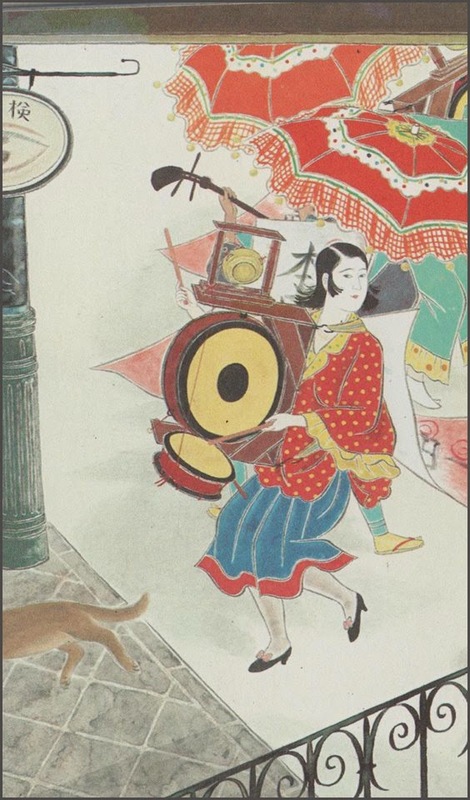 The first known chindon'ya is generally considered to be a candy seller in Osaka named Amekatsu, who around 1845 used singing and a noise making toy to attract attention to his own portable candy stall, as many other salespeople, especially candy sellers. 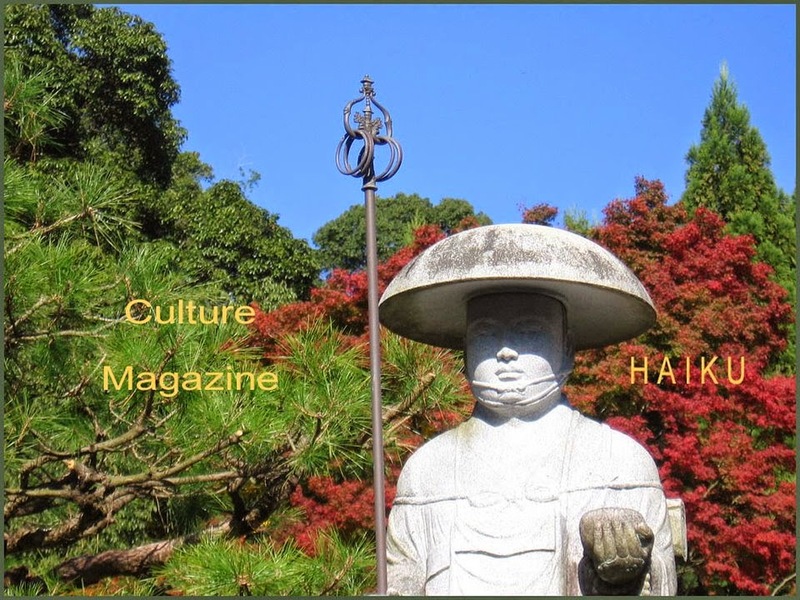 Due to his strong voice he was well known in Osaka, and hence tried to sell not candy but rather advertise for other stores and a theater, wearing a large hat and straw sandals, and small bells at his belt, and used a wooden hyogoshi noisemaker. He was succeeded by a former bath attendant Isamikame, who also used to shout tozai (Literally East-West, equivalent to Listen up or welcome (come one come all)). Subsequently, such advertising street performers were called tozaiya in Osaka up to World War II. 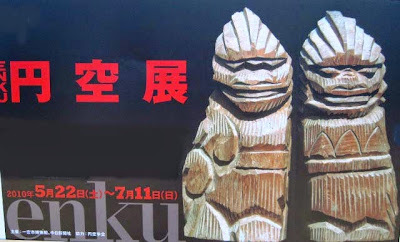 He soon received competition from another advertiser called Matemoto, and they split their business, with one covering the Uemachi region and the other covering the Shinmachi region of Osaka. After Maemoto died in 1891, his brother, also called Maemoto took over the business, and he was soon joined by his son and daughter, probably the first female chindon'ya. Maemoto is also famous as being the first person in Osaka to die from electric shock in 1893. 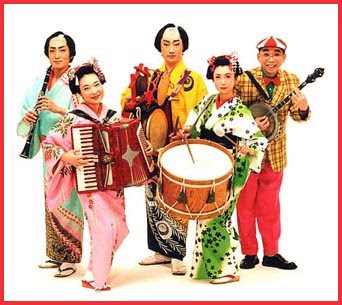 Other well known performers from this time are Tanbataya Kurimaru, a former Sweet Chestnut seller, and Satsumaya Imosuke, a former bean seller. These two also occasionally added a second performer to their band. At the early Meiji period, such advertising was still unknown in Tokyo, and advertising was mainly done on curtains (noren), billboards (kanban), and flyers (hikifuda). Stalls also advertised for themselves by making noise and wearing colorful clothes, a at the time widely known example being the extremely colorful dressed pharmacist Iwashiya. During this time, newspapers and posters also started to appear in Japan and were used for advertising. The military also started to popularize western style marching bands, and at the same time public bands started to appear. In1885 an advertising agency in Tokyo hiromeya(wide eyes) hired musicians for advertising. 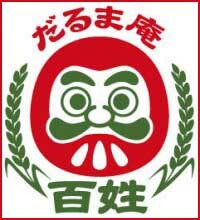 Hiromeya was founded by a former tozaiya from Osaka Akita Ryukichi. He soon found out that a one person band was not as popular in Tokyo as in Osaka, and hired larger bands of more than 10 performers for advertising purposes, following the popularity of military and public bands. His band also provided entertainment at festivals and parties, and also created background music for silent films. He was also hired by the Kirin beer company, whose advertising campaign spread out to Osaka. 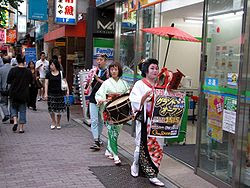 In Osaka, this form of group bands was yet unknown, as only individual performers were hired for advertising. The police also had to stop some of the larger performances in Osaka, as they hindered traffic, partially also caused by the 2 meter tall beer bottle the group was equipped with. The Hiromeya business grew, and they were even asked to perform at the burial of Emperor Meiji in 1912. The business still exists nowadays, although they now do mainly decorations. ... There are also amateur and student troupes. 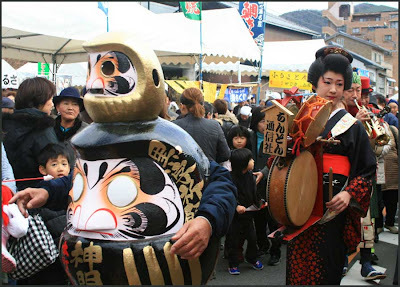 A good place to check out the state of the industry is the Chindonya Championship, held every April in Toyama City, Toyama Prefecture.
. Hoshino Tsubaki 星野 椿 .
. gannin boozu 願人坊主 mendicant monks . Welcome to Daruma An Farms! Daruma An Farms is a family owned and operated farm located on Sado Island, Japan. 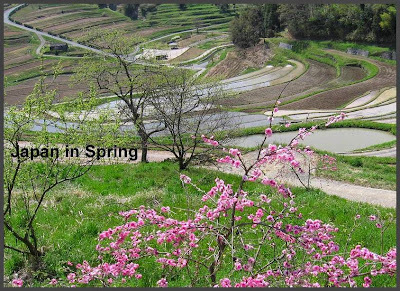 We grow Koshihikari, Organic Hananomai, and Organic Black Rice. We can ship our rice anywhere in Japan, so please check out the Shop if you would like to purchase some! Created in 2009 on Sado Island, Japan, Daruma An Farms is two families working together to grow delicious rice in the most environmentally friendly methods possible. We grow several varieties of rice, including Koshihikari, Koshiibuki, Hananomai, and Kuromai. Most of our rice is grown using conventional methods--planting machines, synthetic fertilizers, pesticides, weed-killers--though, each year an increasing percentage of our rice is grown completely organic--no use of pesticides or weed-killers and only using natural fertilizers. 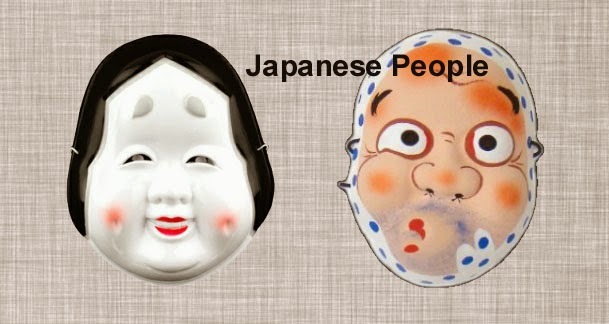 are Japanese emblems used to decorate and identify an individual or family. While mon is an encompassing term that may refer to any such device, kamon and mondokoro refer specifically to emblems used to identify a family. The devices are similar to the badges and coats of arms in European heraldic tradition, which likewise are used to identify individuals and families. Mon are often referred to as crests in Western literature, which is another European heraldic device that approximates the mon in function. On the battlefield, mon served as army standards, even though this usage was not universal and uniquely designed army standards were just as common as mon-based standards. Check a long list of famous Japanese crests! The space for a family crest was usually left white by the cloth dyer and a special painter added the pattern and colors. Since crests had become quite popular with the townspeople of Edo, they were used not only for official robes but also for decorations of every-day things, even 手ぬぐい tenugui hand towels. 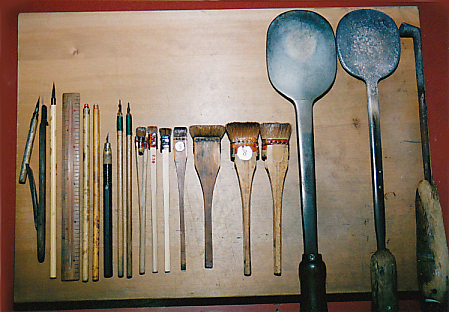 The workshop of a crest painter did not take up much space and could be done in a small home in Edo. There are different styles of mon too. 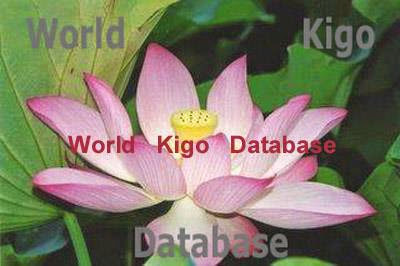 In the picture below, showing three variations of icho (ginko) mon, you can see three versions of a the mon: hinata – full sun (left), kage – shadow (middle), and nakakage – mid shadow (right). The more subtle versions are for slightly less formal occasions. There are also embroidered mon, called nui mon. A family may choose a mon that is associated with their family (a family mon is called a kamon) or just opt for one they like instead. They are seen on all sorts of items in Japan: clothing, signs, boxes, ceramics, banners etc. Dressed in a black kimono and wearing a pair of eye-catching black, triple-framed spectacles, Shoryu Hatoba straightens his back as he sits on the tatami floor of his quaint studio in Ueno, central Tokyo, holding a pair of bamboo compasses fitted with a brush dipped in ink in place of a pencil. 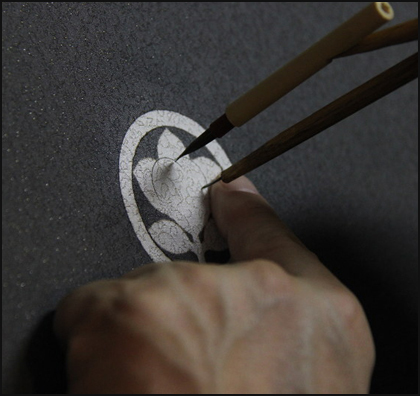 But 56-year-old Hatoba is now one of a dying breed of monshō uwae shi (family-crest painters and designers). “I’m an endangered species,” the Tokyo native concedes. That’s because Japan is now on the verge of losing the tradition of making and preserving the ritual or everyday use of kamon (family crests) — which pretty much everyone in the nation once had. That’s despite the fact that its first known family crests date from the eighth century, when nobles at the Imperial court, and then samurai warriors, started using them as badges of identity or ownership. 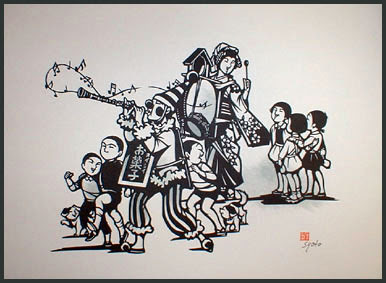 But unlike in the West, where family crests were exclusively for the nobility, in Japan their adoption grew exponentially during the Edo Period (1603-1867), and especially during its economically and culturally vibrant golden age known as the Genroku era (1688-1704), Hatoba explains. 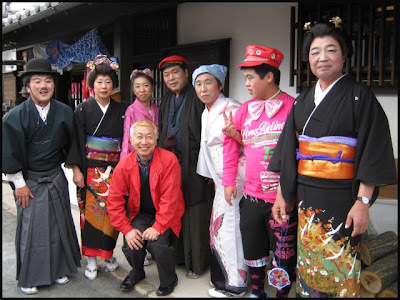 Then everyone, but men mostly, started featuring them in whatever design they liked on their kimono. That even included commoners — who mostly had no family names at all until a law in the modernizing Meiji Era (1868-1912) required everyone to have one — though Hatoba says women were generally late to the kamon party, only adopting them at the end of the Edo Period. The crests’ motifs are derived from a wide range of plants, birds and other animals. As a profession, monshō uwae shi demands microscopic attention to detail and command of many sophisticated techniques — not to mention aesthetic sensibilities. 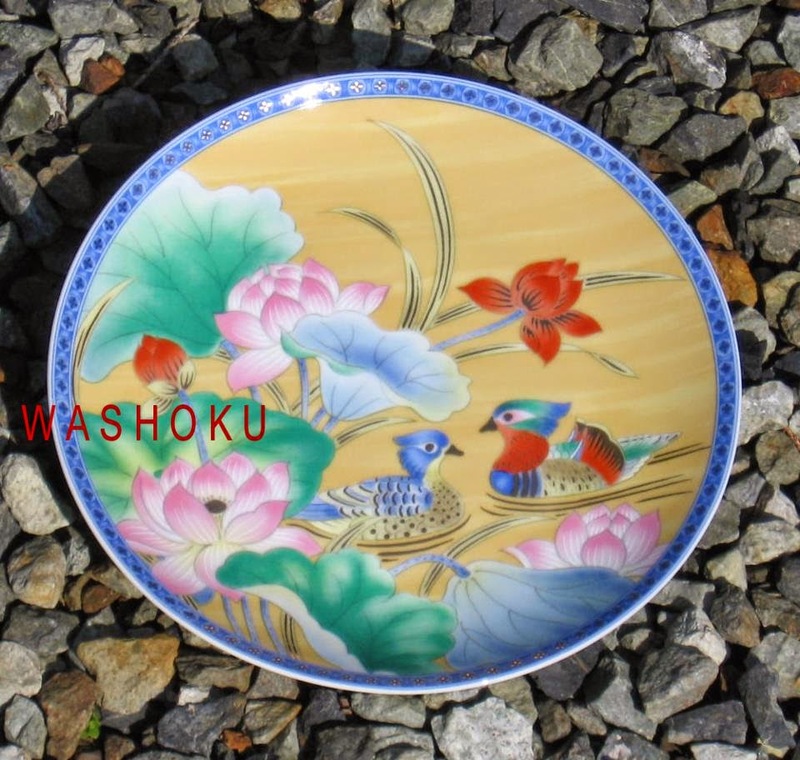 And, as Hatoba explains, a crest’s component parts all have to be rendered in a circular design on average only 38 mm in diameter for men’s kimono, and 21 mm for women’s. Interestingly, too, the number of crests on a kimono ranges from one to five — with more crests reflecting an occasion’s greater formality. Hatoba, who apprenticed under a kamon craftsman for five years before opening his shop, is determined to keep the tradition alive. To do that, he has collaborated with creators and corporations in various genres, featuring kamon designs on everything from bags to boxes of wagashi (traditional Japanese) sweets. 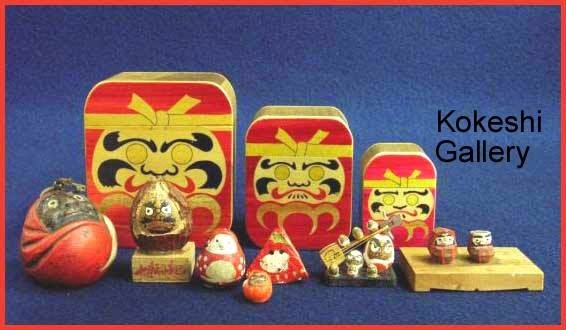 The famous inro box with the "mondokoro" from Mito Komon. A tomoe (巴), also 鞆絵, and tomowe (ともゑ) in its archaic form, is a Japanese abstract shape described as a swirl that resembles a comma or the usual form of a magatama. 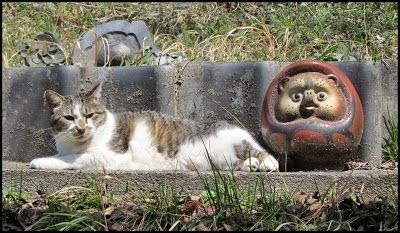 The origin of tomoe is uncertain. Some think that it originally meant tomoe (鞆絵), or drawings on tomo (鞆), a round arm protector used by an archer, whereas others see tomoe as stylized magatama. It is a common design element in Japanese family emblems (家紋 kamon) and corporate logos, particularly in triplicate whorls known as mitsudomoe (三つ巴). 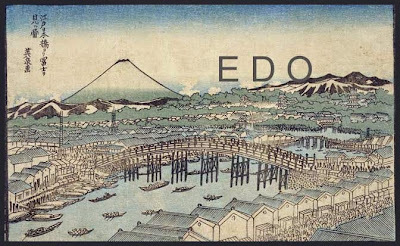 Some view the mitsudomoe as representative of the threefold division (Man, Earth, and Sky) at the heart of the Shinto religion. Originally, it was associated with the Shinto war deity Hachiman, and through that was adopted by the samurai as their traditional symbol. One mitsudomoe variant, the Hidari Gomon, is the traditional symbol of Okinawa. The Koyasan Shingon sect of Buddhism uses the Hidari Gomon as a visual representation of the cycle of life.
. Hachiman Shrines in the Edo period . The Hidari Gomon and it was once the Royal crest of Ryukyu Kingdom in Okinawa. In Japanese it is called the Hidari mitsudomoe and is a common design element in Japanese family emblems (家紋) and corporate logos. 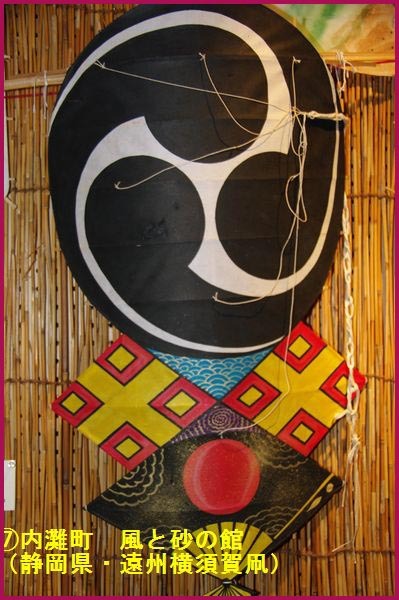 The Hidari Gonon is the primary traditional symbol of Okinawa. It is unclear who used the symbol first but it has special significance to the Okinawan people especially those practicing the ancient art of Okinawan Karate. I have heard a couple different interpretations of the meaning of the symbol so their may be more than one definition for the symbol. The Koyasan Shingon sect of Buddhism which came from China to Japan uses the Hidari Gomon as a visual representation of the cycle of life. 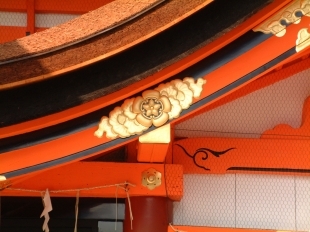 Others believe that the symbol is Shinto related because in Shinto mythology the symbol is often used to signify the structure taking place between three worlds. Such worlds include heaven, Earth, and the Underworld. One explanation that was particularly interesting to me was the Okinawan folktale where they interpret the "Hidari Gomon" as representing loyalty, heroism, and altruism to a proud island people and their descendants. They believe it to be expressed through a past full of struggle and hardship, but also a willingness to face the difficulties the ahead no matter what the cost. Later, back in the Ryukyu Kingdom, the envoy described the death of three warriors to the King. The King after hearing the story of the Ryukyu guards deaths had up the Hidari-Gomon drawn up to symbolize their heroic action. 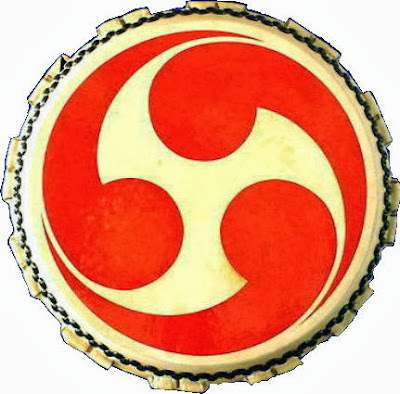 The symbol is said to portray the three Ryukyu warriors spinning around in the pot giving their lives for the greater good of the people. The symbol has since become the symbol of the Ryukyu Kingdom, a symbol which can now be found just about everywhere in Okinawa. 1 - Also tomoe 巴. A pattern of one or more curled tadpole shapes inside a circle. The pattern is also called right tomoe, migidomoe 右巴, or left tomoe, hidaridomoe 左巴, depending on the direction in which the pattern curves. When the comma shapes are placed in opposite directions, the term kaeruko domoe 蛙子巴 is used. 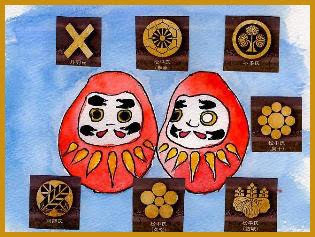 The expressions double tomoe, futatsudomoe 二つ巴, or triple tomoe, mitsudomoe 三つ巴 are used depending on the number of tadpole shapes used. 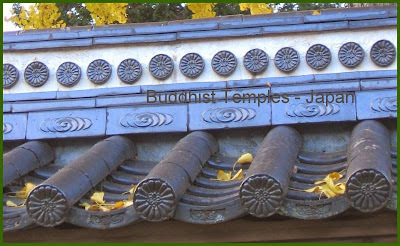 The pattern was used to decorate the eave-end semi-cylindrical tiles *nokidomoegawara 軒巴瓦, *nokimarugawara 軒丸瓦 on Buddhist temples. 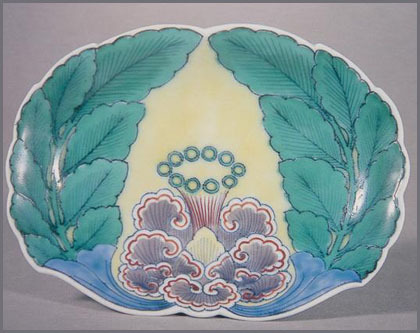 The pattern first appeared in the Heian period and has continued to be popular to the present day. Sharp pointed tomoemon forms in the Heian period gradually changed to short rounded forms by the Edo period. 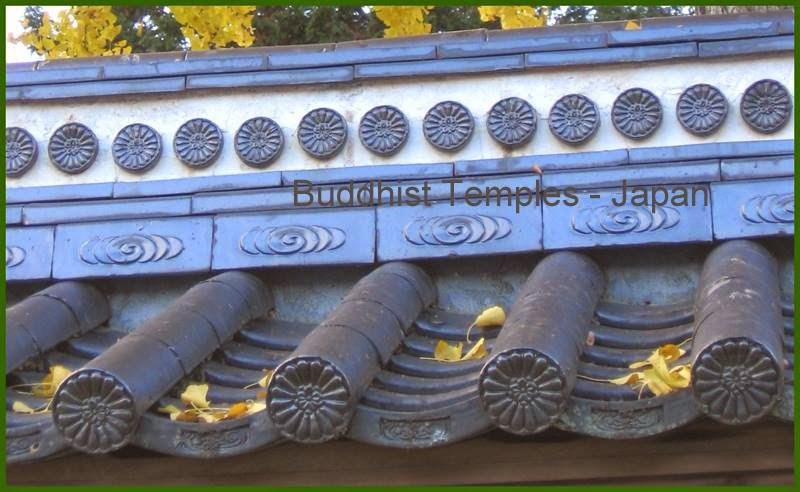 The same is design is also found on roof-tiles in China, where the tomoemon is associated with water. Therefore, the tiles are believed to ward off fire. A tile with this design is known as *tomoegawara 巴瓦 or *hanamarugawara 端丸瓦. A design pattern comprised of one or more spherical head-like shapes each with a connected curving tail-like shape which ends in a point. The character tomoe 巴 means eddy or whirlpool; however, it is not clear if this was the original idea of the design. Some scholars are convinced that it stems from the design on leather guard worn by ancient archers-tomo 鞆 thus tomo-e 鞆絵, a tomo picture. Others say it was originally a representation of a coiled snake. It may be the oldest design in Japan, because it is similar in shape to the *magatama 曲玉 jewelry beads of the Yayoi period. It appears as a design on the wall paintings of the Byoudouin *Hououdou 平等院鳳凰堂 (1053) in Kyoto, and in the Illustrated Handscroll of the Tale of Genji Genji monogatari emaki 源氏物語絵巻 (early 12c). It was widely used from the Kamakura period onward and is often found on utensils, roof tiles and family and shrine heraldry. Its frequent appearance in connection with Shinto shrines indicates that it was thought to express the spirit of the gods. Patterns of one, two and three tomoe exist, some facing left, others right.
. 静岡の凧　Kites from Shizuoka . 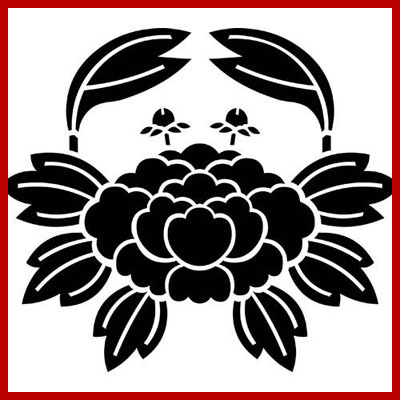 A crest where the blossoms and leaves of a peony are formed in a way to represent a crab. It was often used for cloths and carpets.
. Kani Yakushi 蟹薬師 "Crab Yakushi" Temple . 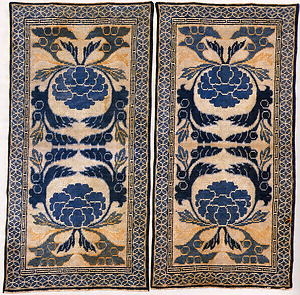 Carpet with kani botan pattern. If people fought about the parents of a child, in former times, they used to wash the 胞衣placenta in water and when it floated up, the proper Kamon would show. In former times at this fisherman's home a dead body got caught in the net. 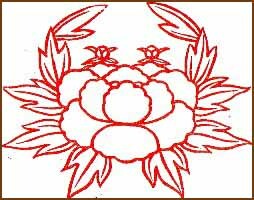 The family had taken care of it in a funeral, but since the family crest was different, the man's sould could not go to the Buddhist paradise. So they performed a special ritual and he was healed. If people wear a robe with a family crest, put up a candle and look through the long sleeve of the kimono, they could see a Garappa. If people went swimming in the river during the 祇園さん（天王さん Gion Festival, the Gataro would pull them in the water, so swimming was not allowed during that time. 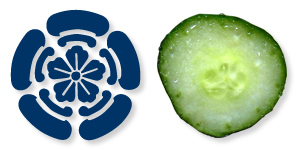 The Shrine crest of the Gion shrine was a cucumber cut in slices, a favorite food of the Kappa. So during that festival people were not allowed to eat cucumbers.
. Kappa Legends from Kyushu 河童伝説　- 九州 . at a place called Ipponsugi 一本杉 (one cedar tree) a fox used to come out clad as a human in a 紋付羽織 haori coat with a family crest.